I’ve been having some conversations recently with local artists and photographers about showing, marketing and selling artwork or services. It is something that every artist comes up against at some point and everyone has to explore the subject and find their own solutions. But it doesn’t do any harm to share books and other resources that have been useful . Two books that I’ve found helpful, more with regard to my portrait photography have been “ The Brand Called You “ by Peter Montoya and “Selling the Invisible” by Harry Beckwith . Although artists may not tend to consider themselves a brand a lot of the information in these books could equally be applied to art marketing. As you get to grips with what you want your brand to represent or when you are preparing press releases or artist statements you might find this book useful ” Brag – The Art of Tooting our own Horn with out Blowing it” by Peggy Klaus. I worked through it last year, as I was preparing press releases for my exhibition and I’ll be repeating the exercise again this year. She also has the basic 12 item questionnaire available online at www.bragbetter.com to get you started straight away. Another older book, but still valuable is “How to Survive and Prosper as an Artist” by Caroll Michells. A good portion of this book contains lists of other useful resources, publications, organisations or websites. I have an older edition but I notice it has been updated last year. And finally, specifically with regard to press releases, Joan Stewart has great advice at her website The Publicity Hound with a great weekly newsletter too. Do you have a favourite art marketing book or resource that you’d like to share ? I’d love to discover some new ones. Almost as hard as choosing best trip is choosing best place. There were so many spots I visited in the course of the year. So many cosy cafes, interesting streets, perilously high view points, to pick just one is a tall order. 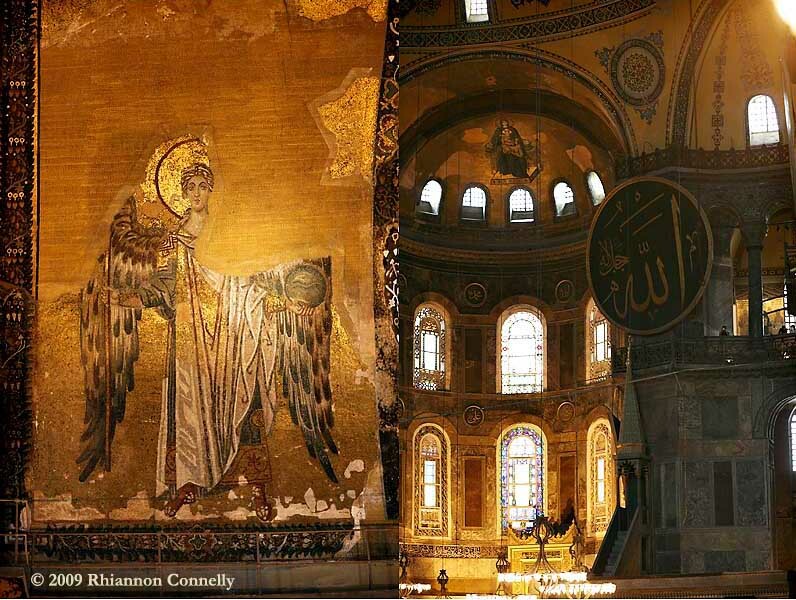 But if I have to, then my “place of 2009” is the Haghia Sofia. My whole visit to Istanbul was full of a lot of very vivid sights and sounds, and though I am used to travelling on my own, stretched my coping reserves somewhat. So it was a pleasure to visit the Haghia Sofia on my last morning, in the company of a new friend who immediately removed all the hassles that otherwise confront a solo female traveller. Haghia Sofia itself is a rather surreal experience. Completed in AD 537, it was the greatest church in Eastern Christendom for nearly a thousand years until the Ottoman Turk armies took the city in 1453. This creates a foundation of familiar Roman architecture with the Islamic elements superimposed on the top. In one building it sums up the different historical eras of Istanbul’s past. After the Budapest Details post I’ve been on a bit of a roll compiling detail mosaics from a few other cities. It’s not really how I intended to use these elements as I was collecting the details for use in a collage project. However, I rather like how they have been turning out. In other news, I was featured in two beautiful blogs recently Bright Bold Beautiful and Bella Vita Home – pop over and have a look. Istanbul - 12 City Project. A quick glimpse at some of the work in progress. 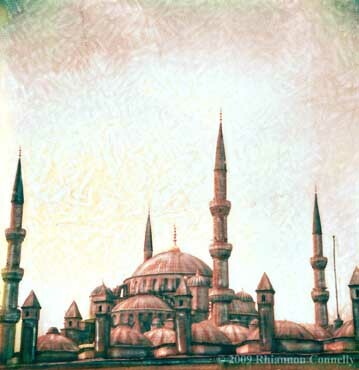 Istanbul is city number 9 in my series of 12. I particularly wanted to include this city to provide a bit of real contrast with the Western European cities. In each city I have tried to photograph one or two very recognisable locations , but apart from that have shot images purely for their personal appeal. This has revealed an interesting aspect – that many cities are not immediately identifiable, once you are away from the iconic spots. Maybe some of the photos from Istanbul will also fall into this category. However most of them have a very clear sense of place. I particularly like this shot because it was my view for breakfast every day, and also the roof terrace where I did all the manipulations in the evening. Supplied with cups of tea by the kind hotel staff and with a gentle breeze coming in off the sea. As well as processing my images from this trip I am also already preparing for the next 2 cities Budapest and Sibiu at the end of June/beginning of July.